Would you like some rabbit meat? Or what about pig stomach or a pair of bull testicles? My travel partner Henrik and I found ourselves at La Boqueria, Barcelona’s famous food market. Lucky for us, it also was bursting of products that are less exotic for us Scandinavians. Stall after stall with ham, fresh seafood, juices, cheeses, spices and of course tapas, made my stomach rumble. Fortunately, we did not go hungry for long. 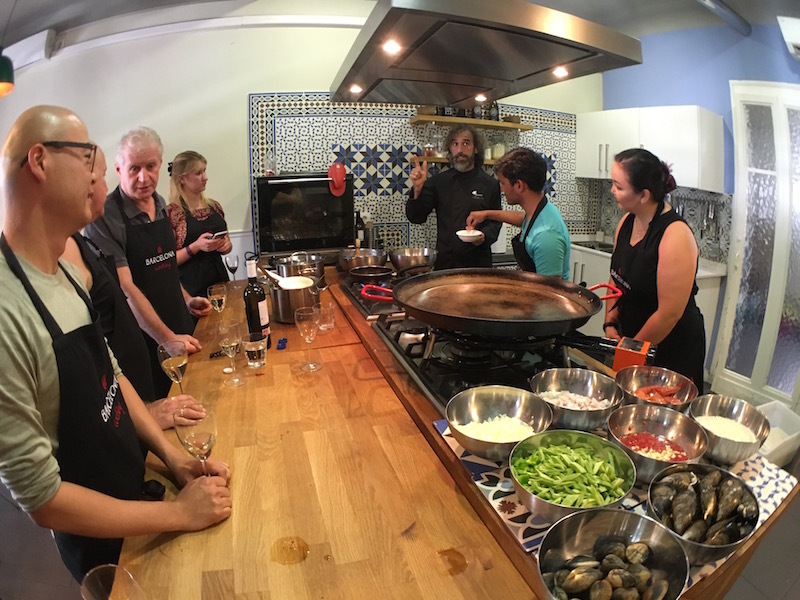 When we were done buying the necessary ingredients, the next few hours were devoted to preparing and eating the most delicious Spanish food. 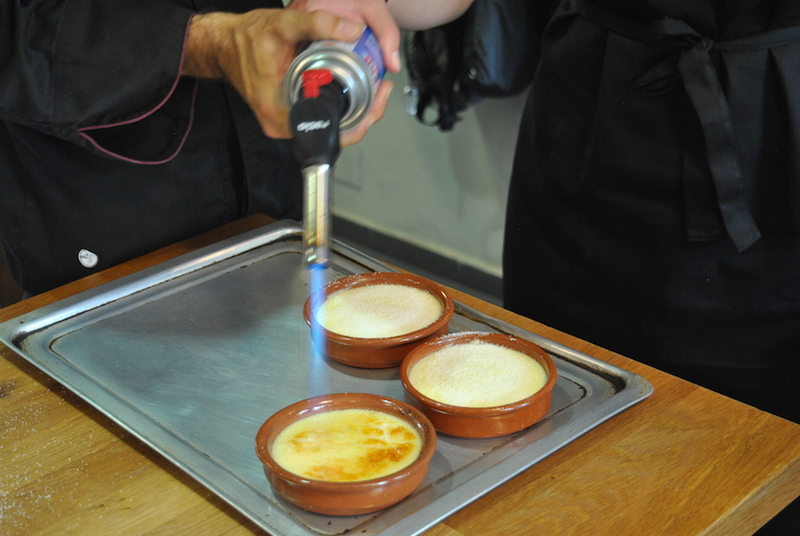 This article was made in collaboration with Barcelona Cooking. All descriptions reflect my own opinion, and the business has had no influence on the content of this review. 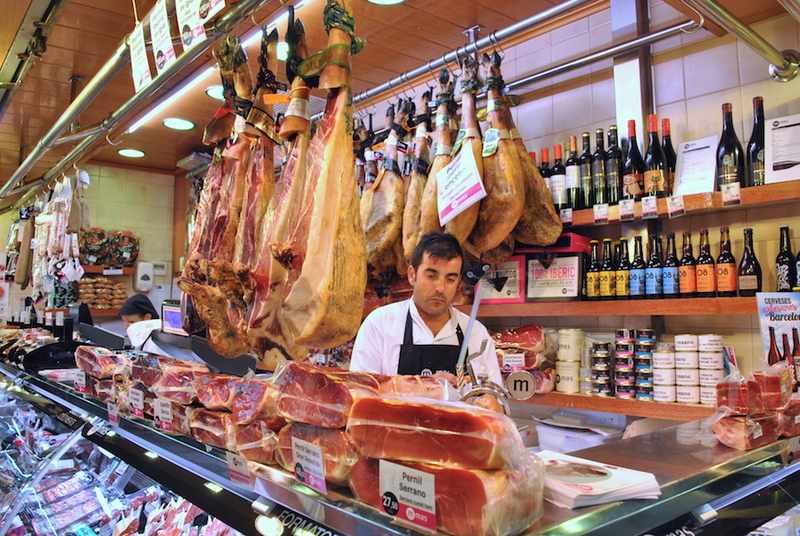 We got to taste the difference between iberico and serrano ham. 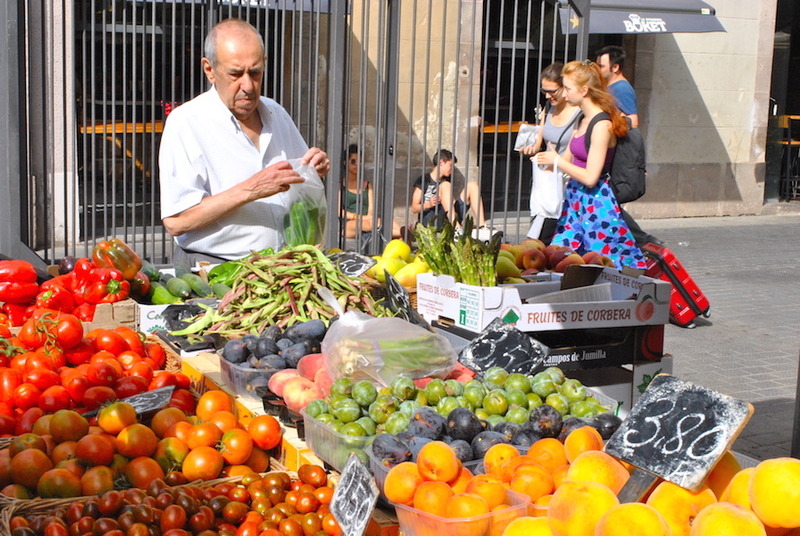 La Boqueria food market is popular with both locals and tourists. It’s become so popular that large groups of tourist are no longer allowed during certain times on Saturdays. 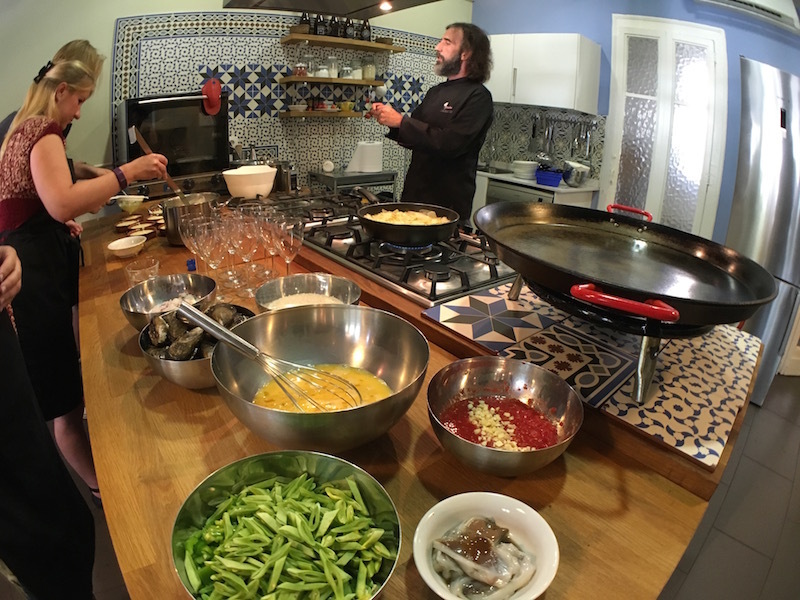 The cooking class we attended took place in the spacious premises of Barcelona Cooking, which is easily accessible from the famous La Rambla. The school opened in 2012, and currently offers five different classes. In addition to the two of us, nine other people signed up for this course. They came from the US and Australia, and the atmosphere quickly became friendly and laid back. The chef and teacher, Cándido, split us into four groups. Each group was responsible for their own dish. He went through all four recipes in a fun and informal way. It was clear that this man loves both food and teaching. Cándido is patient and clever, and I got the impression that he really enjoys teaching us clumsy tourists as we do our best! 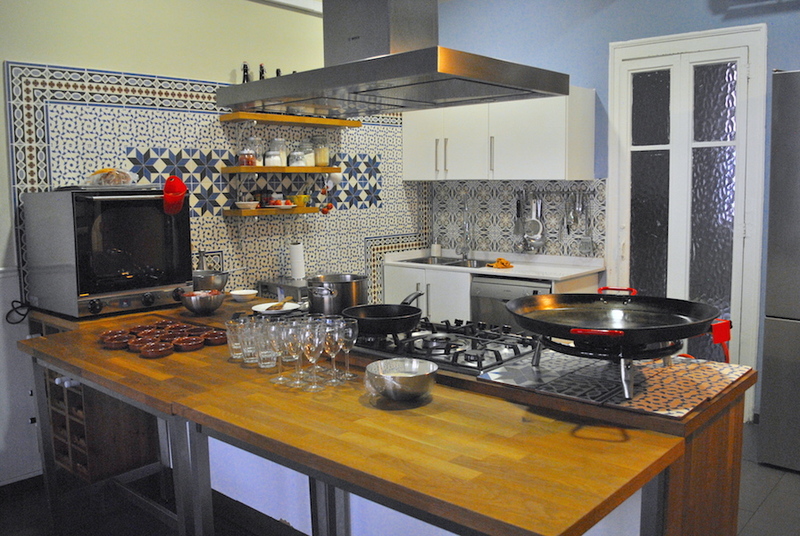 The cooking class is equally suitable for women and men, as for lovers and friends! 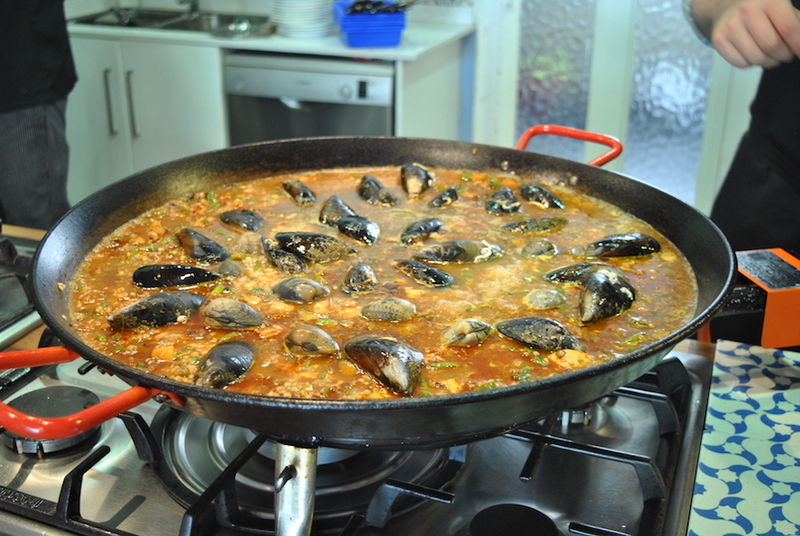 The dishes on the menu were tortilla española (Spanish potato omlett), gazpacho (cold tomato soup), paella with seafood and crema catalana. All the participants were focused, but there was also a lot of laughing as we chopped, peeled and cut. The equipment we used seemed new and of good quality. Cándido shared interesting facts and taught us clever tricks along the way, including how to chop vegetables without leaving a fingertip on the cutting board. Halfway through the class our glasses were filled with wine, and then the work continued. The whole time Cándido offered to help us, and answered all of our questions. 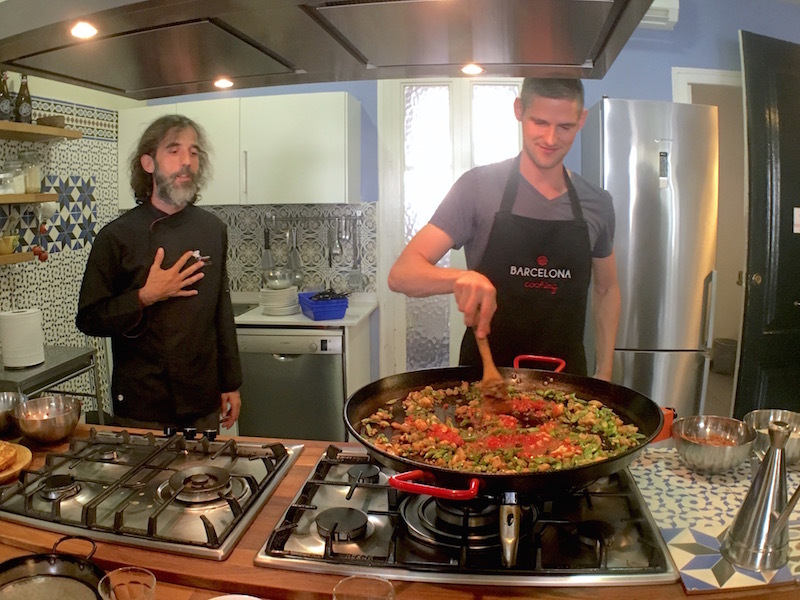 Henrik and I ended up on the group that prepared the paella, and although I did not contribute directly to all the other dishes, I think the day had a nice combination of demonstration, observation and our own tasks. We all cooked as much as possible with eleven people in the room and four hours at out disposal! 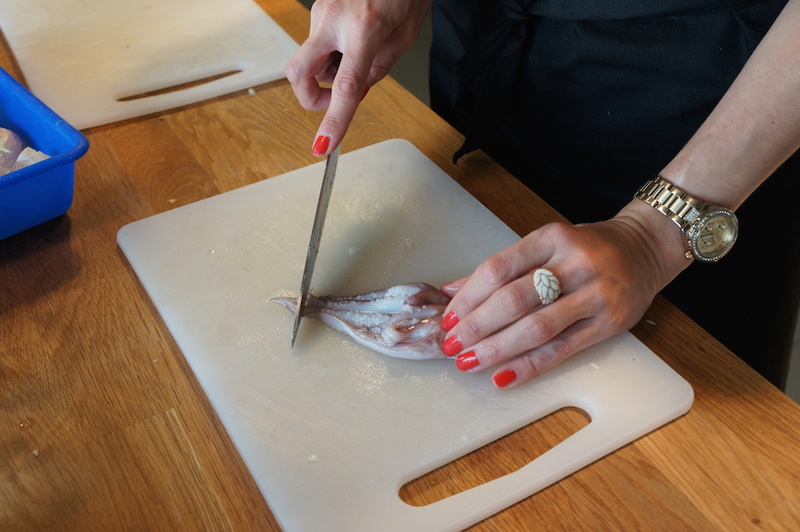 However if you are looking to prepare all of the dishes from start to finish, I would recommend booking a private class instead. Soon the kitchen was filled with aromatic scents of the various dishes that were being prepared. After three and a half hours’ works, it was time to reap our reward. The table was set, and the pearly-prepared food is served with ample amounts of wine. 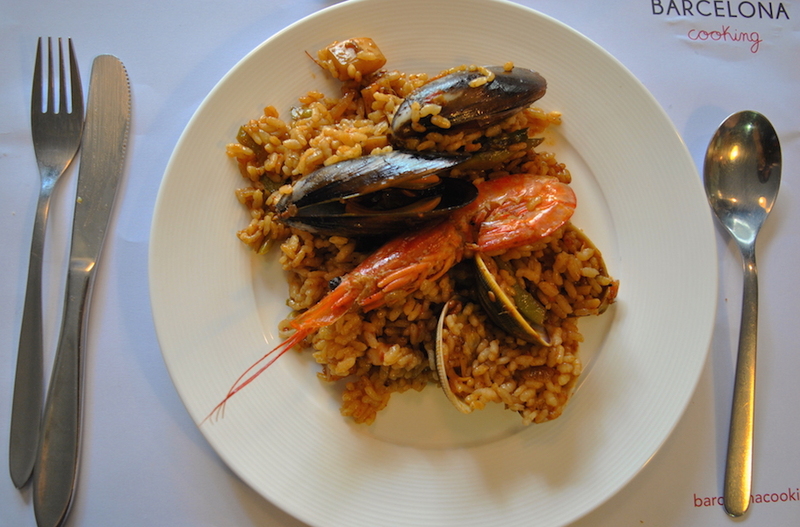 – This is the best paella I ever tasted, said the businessman from New York who sat opposite me at the table. I was amazed at how fresh and flavorful the gazpacho is, and rejoiced when I was offered an extra portion! 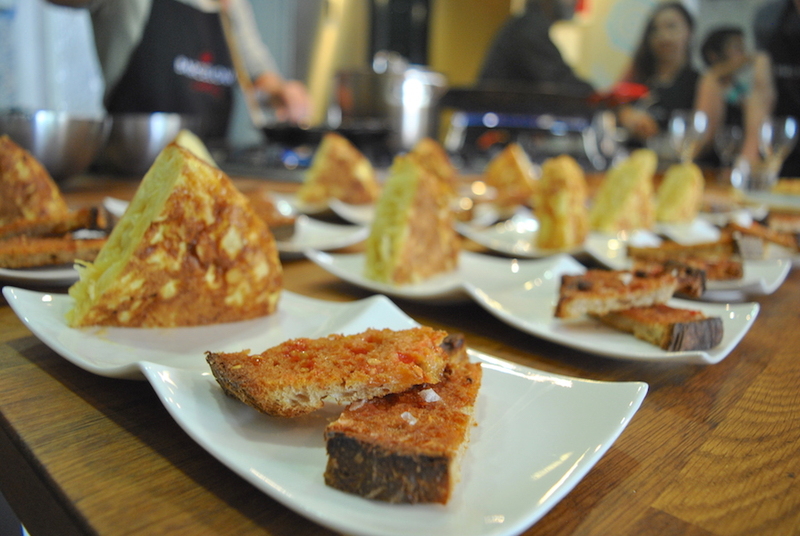 In all modesty: With the help of Candido, we, eleven amateurs, made a four course meal which more or less matched some of the dishes I have been served in Barcelona. Hurray! Four hours after we walked around at the food market, we left the kitchen with bulging stomachs, a digitally delivered recipe in our inboxes and a fun memory richer. Only one thing remained to make this day complete… a nap on the beach! 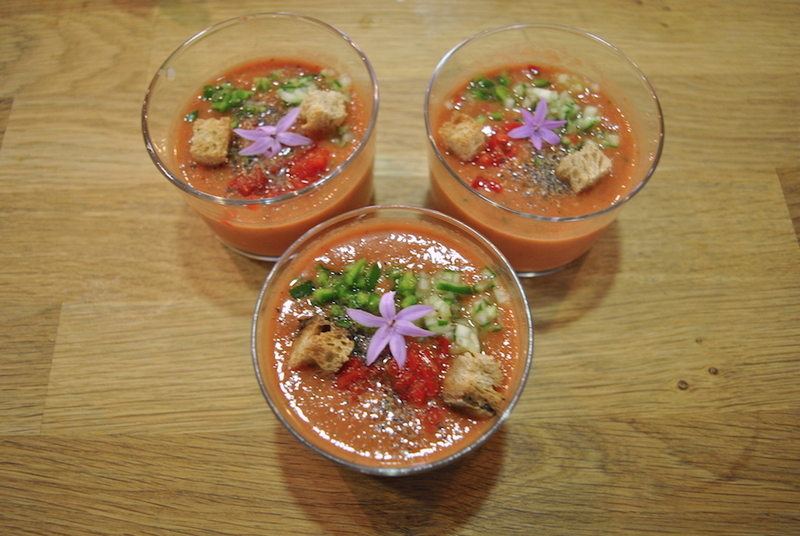 Gazpacho is perfect to keep in the fridge on hot summer days. Did reading this article make you hungry? Try making one of the dishes yourself! Here is the recipe for the healthy, Spanish tomato soup. Firstly grate the tomatoes and cut up all the vegetables. Then set aside about 50g of the cucumber, green pepper and red pepper and dice them very finely to garnish the gazpacho. Soak the bread in the water and the vinegar. Then, in a bowl, mix all the vegetables together and pour the soaked bread in and blend while adding olive oil to emulsify. Refrigerate it for at least 1 hour. Garnish and serve.